We specialize in the development of business plans and the roll out of profitable and sustainable commercial projects for the production of Moringa oleifera for bio-fuel and other products in African countries. We work from a conservative and responsible point of view and favour an integrated farming system with the production of both primary and secondary moringa products and by thus reducing risk to the minimum and optimizing the potential for long term success. Compiling a production plan or business plan is not easy and best left to Agricultural/ Horticultural professionals. These professionals have studied the field and are equipped to understand growing conditions, the physiology of the plant and the economics of production plans. So you have an option to hire such professionals to develop your production plan. The only problem is, they are scars and with rates starting from $ 150/hour. In general a professional production plan can cost thousands of dollars. With this in mind we have realized that many community projects and small entrepreneurs do not have the financial means to pay huge amounts for consultations and we had a time limitation in consulting each entrepreneur on an individual basis. We took all our knowledge, combine it in a workable system that would help the entrepreneur to build production and business plans fast, with low cost and is workable for specific conditions in which the entrepreneur operates in. 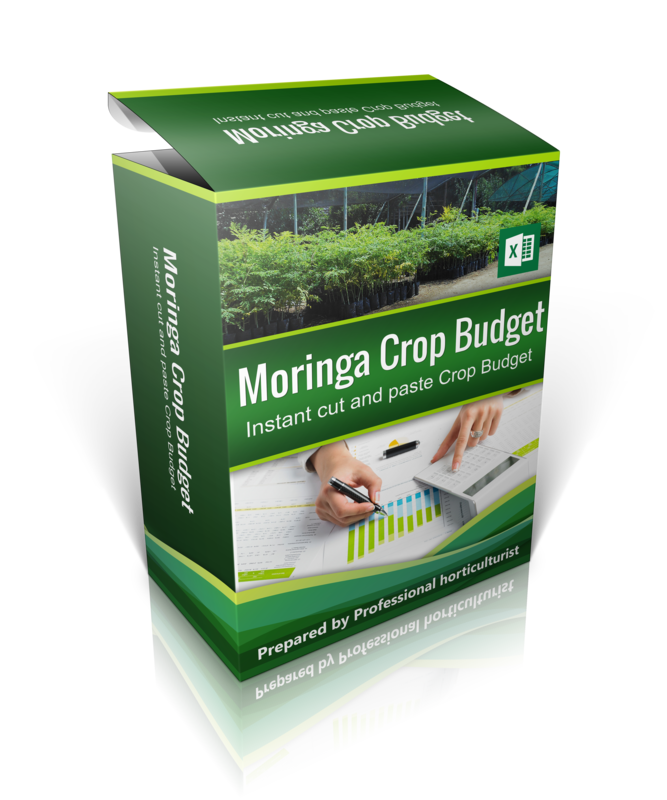 The Crop Budget is a cash flow model that summarizes the direct cost and income associated with the production of Moringa with a specific production system, on a specific size of land, over time. It is a useful tool to study the sustainability of a specific production system and to compare different production systems. The crop Budget is a financial planning tool that forms the basis of the economic model and business plan. The crop budget can give a good indication of the Gross profitability of a specific production system. Does any of the following sound familiar ? I need a cost/income analyzes for moringa production. I need yield predictions for strategic planning of my marketing and sales. I need a cash flow projection for moringa production. I need an economic analysis for a business plan or for finance purposes. I have spend hours on the web looking for applicable information with limited success. I need a financial planning tool. I am at a loss at were to start.